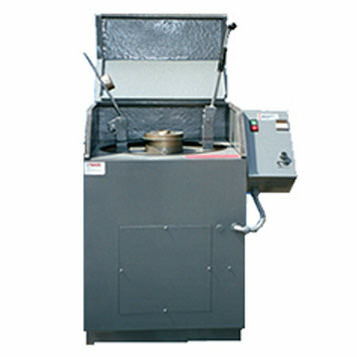 This gyratory cup mill uses two rings and a puck inside an 8″ hardened chrome alloy steel 250g grinding bowl. A motor, directly coupled to a rotating eccentric, swings the bowl and its contents rapidly reducing 1/2 ” feed to as fine as 325 mesh. Areas of applicability include: 2 minerals, ore, cement, rock, soil, and similar materials. During operation, the insulated cabinet is sealed for reduced noise. Supplied complete with a 250 ml capacity bowl with grinding components. Dim: 24″Wx24″Dx43″H. SW: 650 lbs.